We have two “state of the art” service facilities located at Bangalore & Chennai. The facilities provides a total of 10,000 square feet of floor space with 4 service bays.The fully equipped facility has all the required diagnostic equipment and special tools. With Ducati Technicians who have undergone extensive training as well as only using Ducati Genuine Parts, we ensure your Ducati keeps performing to its highest capabilities. Just a couple of the reasons these top class facilities maintain the durability, performance, efficiency and safety you would expect from our motorcycles. Buying a Ducati at VST is just the start of a delightful relationship. 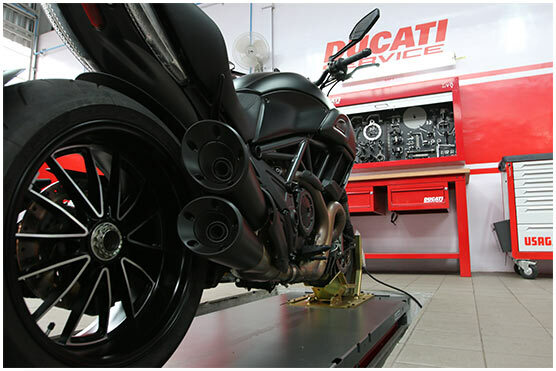 We at VST Ducati ensure that you receive excellent care and attention throughout your ownership experience.